Crustless Vegetarian Quiche – Voila! Every other month a group of friends and I get together for brunch. In the alternate months we get drinks. So we have a good system in place to get together, talk, eat and drink. But when we get together for brunch, we bring our A Game. 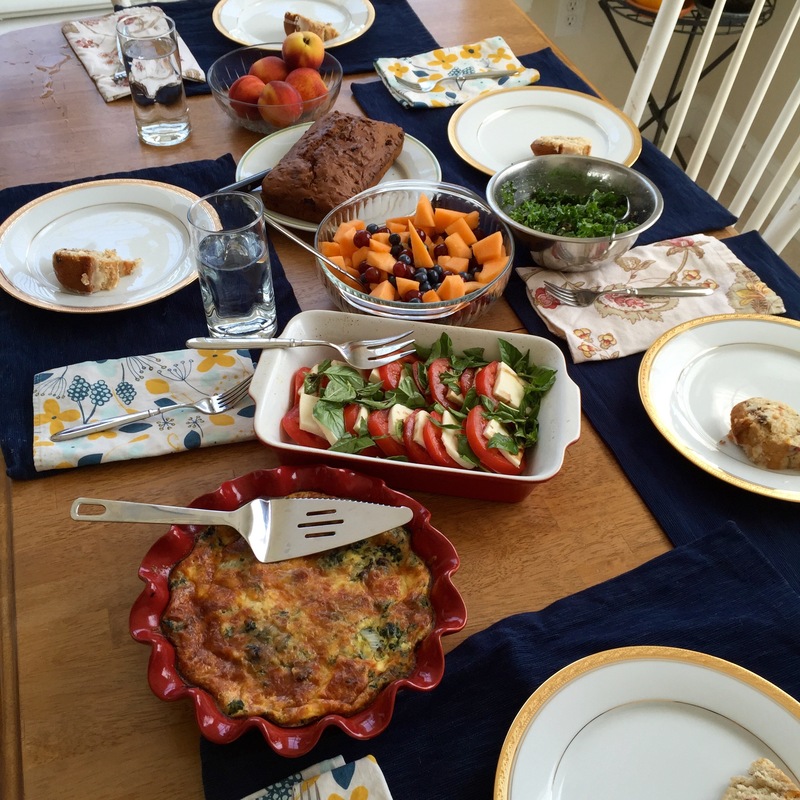 Look at this spread: fresh peaches, carrot quick bread, kale salad, fruit salad, tomato and mozzarella salad, cranberry orange brundt cake (already on our plates) and my crustless veggie quiche! Not pictured: scones and tea in an adorable green pot. So back to the quiche. Delicious and super easy to put together. Not having a crust doesn’t take anything away from the quiche – in fact, it emphasizes the filling even more. Below is the template for the recipe but you can fill this with any type of vegetable you please. You could also, alternatively, use a cupcake tin to make mini-quiche’s, which could also make this an easy breakfast or snack for kids. Rinse your vegetables and slice them thinly. Heat olive oil in skillet over medium heat. Add garlic and sautee until fragrant then add the rest of your vegetables. Add spinach. Pour the cooked vegetable mixture into pie dish and add crumbled feta. In a medium bowl whisk together the eggs until fairly smooth. Add the milk, parmesan, and another small sprinkle of pepper. Whisk to combine.Pour this mixture into the pie dish over the vegetables and feta. Sprinkle the shredded mozzarella cheese over top. Place the pie dish on a baking sheet for easy transfer into the oven. Place the quiche into the preheated oven and bake until it is golden brown on top and the center is solid. Every oven is different but this should take between 40 minutes and an hour. Slice and serve!